Then Jesus told [the Samaritan woman at Jacob's well], "I am the Messiah!" 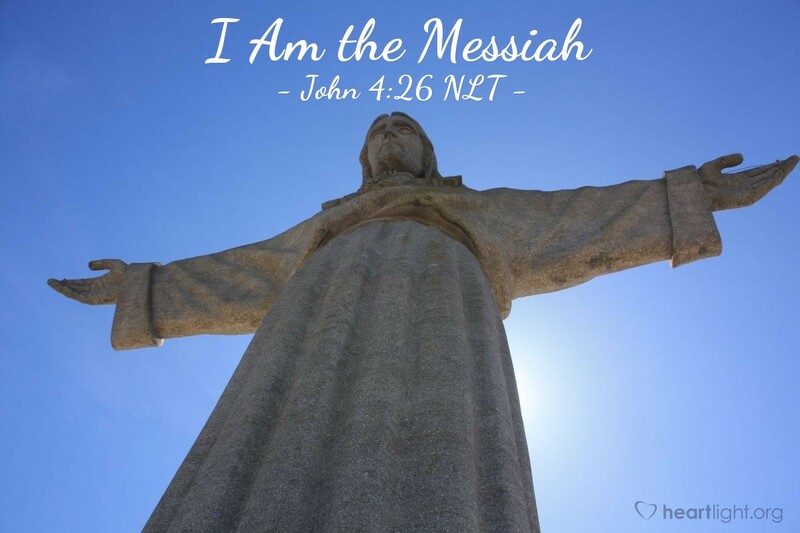 Jesus is the Messiah! Jesus is the Christ of God! Jesus is the long-awaited Savior of the world (John 3:16-17). He was promised to Israel, and in this woman's case, to the Samaritans who also awaited the Messiah like unto Moses. Jesus came in fulfillment of all that God promised Abraham and David. He came as the fulfillment of all the prophecies. He is God's answer. He is our Lord. Let's not only listen to him; let's also live each day for him. Holy God, I believe that Jesus is the Christ. I ask that he be present in my heart in a more vibrant way as I offer myself again to be his disciple and live for him. Forgive me for those times in the past when my loyalty has been tainted by my weakness and sin. Strengthen me so that I may follow Jesus with undiluted devotion. In the name of Jesus Christ, I pray. Amen.